​"I hope that in this year to come, you make mistakes. Because if you are making mistakes, then you are making new things, trying new things, learning, living, pushing yourself, changing yourself, changing your world. You're doing things you've never done before, and more importantly, you're doing something.."
Remember the old cartoon tradition of cartoons depecting Father Time giving way to a baby in the New Year? Well this month's challenge reflects that for all you animators out there! ​Below you'll find a video of a real life baby going throught the stages of learning to walk for the first time, Imagine that you are commissioned to animate that baby stumbling its way into 2017 - full of confidence but not quite capable yet in terms of technique or experience! Imagine too that you're using the footage below as your reference to learn how stumbling babies balance (or not?) and then walk for the very first time. Draw 4 action sketches onto one single file and submit it by the deadline below. You are effectively 'pitching' your ideas for the ficticious animation that might be commissioned from you. (That is, if you sell your ideas to us successfully!) 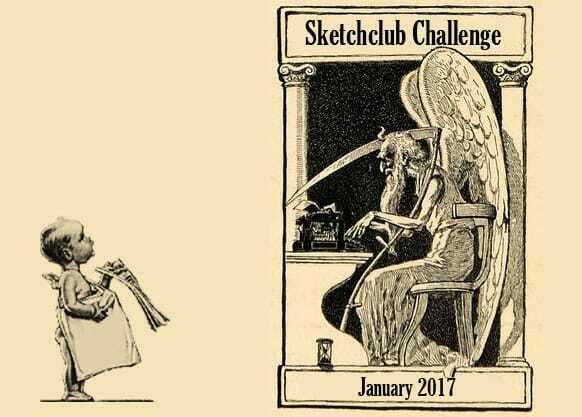 For the challenge you can use any baby design you like - or simple submit 4 sketchbook drawings that you've created from the video below. Submissions need to be in by midnight on JANUARY 29th 2017 (Pacific Time)!. Have fun creating your New Year baby ideas folks! I’m hoping you'll welcome in 2017 with some fabulous drawings for us all!